The new building promotes community, collaboration and innovation, with sustainability built in. 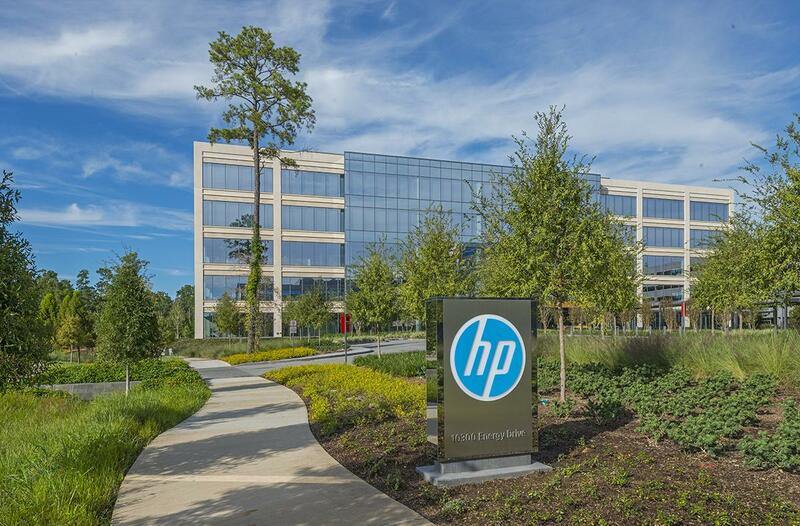 HP’s new Houston campus brings Silicon Valley straight to Texas. A project two years in the making, the 378,000-square-foot campus in Springwoods Village, north of downtown Houston, celebrated its official grand opening on February 7. Two new buildings, constructed from the ground up, replace HP’s previous Houston campus and are now home to around 2,300 employees. The project is one of several HP has embarked on over the last few years to modernize facilities, enhance sustainability and meet the needs of a changing workforce. For the first time in history, five generations are coexisting at work, from Traditionalists (those born before 1946) to Generation Z, people born after 1996. Millennial employees — born between 1981 and 1996 — already make up more than 30 percent of the American labor force. They value things like flexibility, technology, and sustainability at work — driving companies across industries to rethink how and where work happens. HP tapped Houston architecture, design and consulting firm PDR to lead the new campus development project because of the firm’s focus on incorporating workplace strategy and wellbeing features into the environmental building design. PDR also stood out for its process of gathering employee input to inform design. One of several distinctive features of the building is its use of biophilic design, a technique that incorporates natural, organic elements to reconnect employees with nature. Integrating nature into workplace design can increase employee productivity by 8 percent and well-being by 13 percent, according to a recent report by Human Spaces. In Houston, lichen moss plants cover walls and ceilings throughout the building. All the windows stretch from floor to ceiling, allowing for expansive views of the outdoors, a view that will also include the HP garden which will grow herbs and vegetables, tended by employee volunteers. PDR also incorporated nature into design elements throughout the building. Screen walls on the first floor were inspired by a dragonfly wing, while the building’s shades of yellow, blue and magenta are reminiscent of a sunrise and sunset. 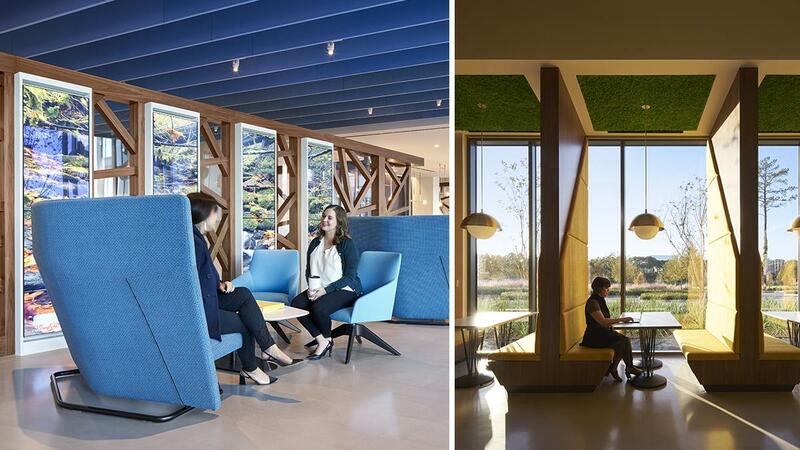 Internal systems at the new campus were designed for employees’ comfort and well-being. Heating, AC and lighting can be customized throughout, and carbon dioxide monitors in large conference rooms trigger a release of fresh air when the room gets stuffy — a welcome development for anyone who’s ever dragged at the end of a long meeting. “All of these systems are affecting your overall wellness,” says Laura Beth Mertz, PDR’s amenities design lead. HP and PDR were also methodical in lighting choices. Designers focused on getting the right amount of light on horizontal and vertical surfaces to have a positive impact on employees’ circadian rhythm. The goal: keeping employees alert at work, and helping them rest easier at night. These systems at the new campus are powered by 100 percent green energy and has already achieved a nearly 40 percent reduction in water use from the baseline standard. This represents a key step toward achieving HP’s organization-wide sustainability goals, including using 100 percent renewable electricity, reducing freshwater consumption globally by 15 percent and reducing the company’s global carbon emissions by 25 percent. : The goal for this building, and all new HP buildings, is to design to meet LEED Gold v4 standards. Sustainability features in Houston also include plumbing fixtures that provide for a lower flow of water; motorized, timed smart shades on windows that automatically adjust using daylight sensors; and a parking garage outfitted with electric vehicle chargers. Almost all of the lighting is LED, contributing to improved energy performance. Power to outlets throughout the buildings can also be set to a timer so they’re not being charged overnight when not in use. Along with a sustainable design, the Houston campus is also designed to let innovation and creativity flourish. HP’s workplace strategy and experience team worked with a core sample group of its Houston employees to understand how they work and the ways in which a new space could enhance their day-to-day experience. What they found was that one size doesn’t fit all: The more complex an employee’s work, the better it is for them to be able to work in multiple settings. A recent report found 66 percent of employees who work in a variety of stations in their office said they work more effectively. At the Houston campus, employees can spend time at individual workstations, private focus rooms where they can take a personal call or inside the library, a quiet room with multiple desks and a no-phone policy meant for focused work. 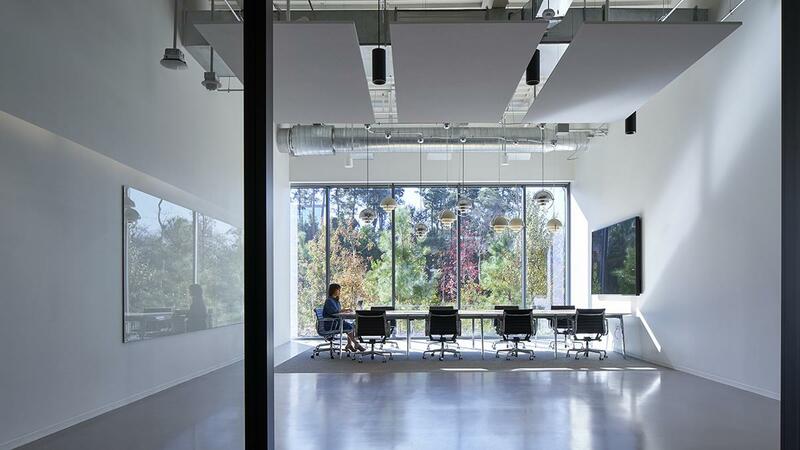 One of the campus’ much-anticipated developments is the area designed for HP Labs, a research team that explores and tests the transformative technologies behind HP products. Previously, HP Labs employees in Houston worked in a dark, enclosed space. In the new building, HP Labs is front and center. Glass walls partially covered with a custom graphic inspired by circuit boards give employees access to daylight while still maintaining a sense of privacy. One of the building’s most innovative features is what’s not in it — closed-off offices, rows of tiny cubicles and stuffy conference rooms that isolate employees by function. Instead, the building’s open design brings employees together. Employees spend around 40 percent of their day in group activities, according to HP research, and with guidance from PDR, HP created a variety of spaces throughout the new campus that encourage both independent and team-oriented work. This variety accommodates the preferred workstyles of multiple generations and creates new opportunities for collaboration. For example, Houston employees from different departments bump into each other on Main Street, the employee hub just inside the main building’s entrance near the reception area. It houses a coffee shop with plenty of seating, the IT desk and the Digital Oasis where employees get a sneak peek at new HP technology and products. It’s where people gather to connect and find out what’s going on. “It’s the heart of the space,” says DelaFuente. Upstairs, employees work in “neighborhoods” based on their business unit. Employees from across departments come together to socialize in community spaces like centralized coffee bars and game rooms with ping pong or foosball tables. The new cafeteria offers healthy choices like build-your-own and grab-and-go salads made from fresh, seasonal, local ingredients, homemade dressings and soon, house-grown herbs from the garden. “We’re also offering healthy snacks throughout the day rather than high-carb foods and sugar,” says DelaFuente. Employees exercising at the on-site gym — complete with showers — can visit the adjoining juice bar, or head outdoors to run or bike on nearby nature trails, play a pick-up game on the basketball court or just sit by the nearby lake. On rainy days, there’s an indoor walking path, and employees also have access to wellness rooms designed for meditation, prayer or for nursing mothers. Why consumer electronics are seeing an industrial design rennaisance.